You can&apos;t tell the story of Panama City Beach without discussing nature - just the word "beach" immediately conjures up images of the white sandy shoreline where you might see seagulls or snowy plovers searching for snacks at the water&apos;s edge, or dolphin chasing schools of fish just offshore in the Gulf of Mexico. But Panama City Beach is also in Bay County, so you have to talk about St. Andrew Bay, which is not only another great opportunity for fishing, boating, or stand up paddleboarding... it&apos;s another very diverse ecosystem to be explored and protected. Lakes in Panama City Beach also serve not just as a scenic backdrop, but also create their own unique ecosystems as well. So what&apos;s the best way to really explore nature in Panama City Beach? Well, it depends on who you ask, but considering that Panama City Beach is bookended by state parks on the east and west, and a huge conservation park to our north, let&apos;s start with those. Most visitors will tell you that for the nature lover, St. Andrews State Park should be your first stop. 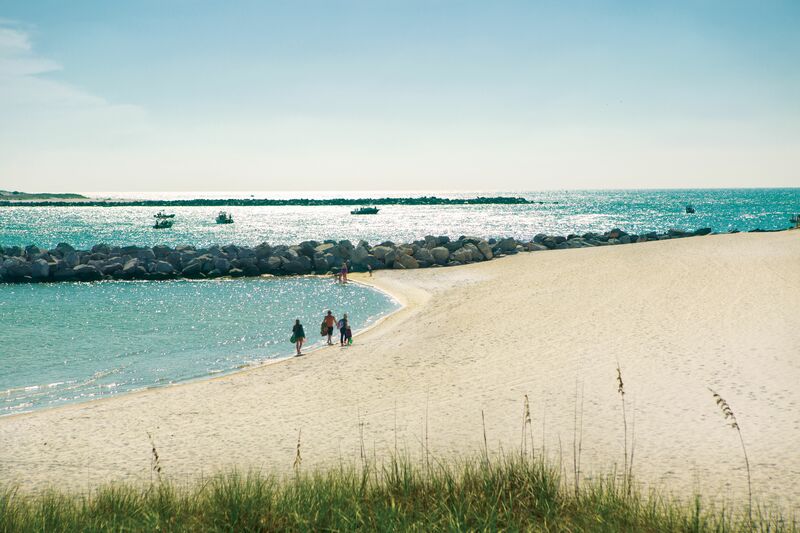 There&apos;s a reason that this is consistently one of the most popular state parks in all of Florida, and it has a lot to do with the mile and a half of natural beach along the Gulf of Mexico, soaring sand dunes, and excellent snorkeling and diving beside the jetties. But there&apos;s also great hiking through the park&apos;s trails - you might spot deer among the pine trees or an alligator at Gator Lake; you can rent a bicycle; picnic in the shade; or take a shuttle to Shell Island, a 6-mile uninhabited island which is one of natural Florida&apos;s greatest treasures. Far less visited, but no less beautiful, is Camp Helen State Park. Things here seem to happen at a slower pace - if you settle in to one of the rocking chairs on the deck of the log cabin lodge it may be a while before you get up again! Spanish Moss hangs from ponderous oak trees, and hiking trails that wind through sand dunes and along beautiful Lake Powell (one of only a few coastal dune lakes in the world!) will take you through several distinct forest ecosystems. Surprisingly few visitors take the half-mile hike that leads across a small bridge and down to the beach, meaning that those who do will likely have a big stretch of beautiful beach to themselves. The pilings of an old fishing pier are still visible, and make for interesting snorkeling. Need to get out of the sun for a while? 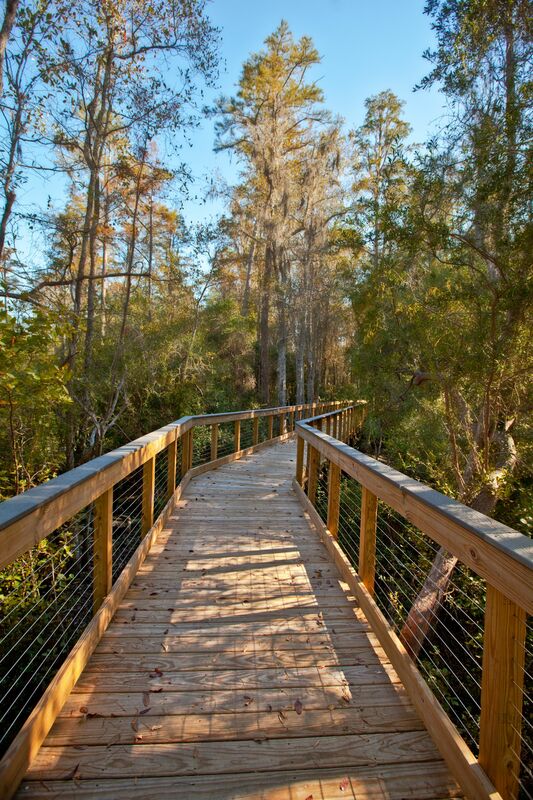 It happens to the best of us, and hitting up the Panama City Beach Conservation Park is a great way to find some shade and explore trails that will take you to boardwalks that cross shady cypress swamps, or twisting and turning though pine forests. 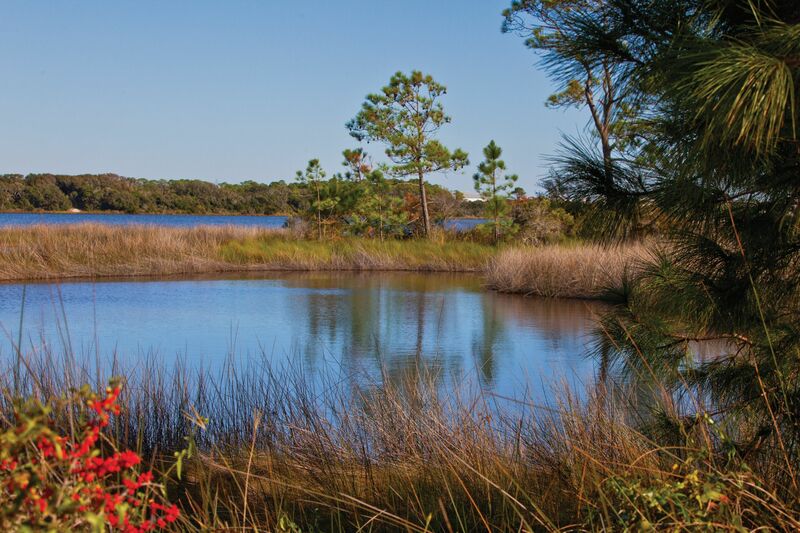 The PCB Conservation Park is great for off-road bicycling, hiking, leisurely strolls, or picnics. Paved bike trails (called Gayle&apos;s Trials) also connect to the park, providing dozens of miles of protected cycling. Another "off the beaten track" option is to check out the backwater creeks and marshes along the intracoastal waterway and West Bay, about 5 miles north of Panama City Beach. Shallow water fishermen love this area, and for the more adventurous, you can even get to see this part of Panama City Beach from an airboat! There&apos;s so much of natural Florida to see in Panama City Beach, and this is just the start (but it&apos;s a good start)! So, happy trails, whether that trails leads through pine forest, along the beach, or by the bay.